Make Pancakes, Waffles or Crepes! Sugar Free! Top it off with a Sugar Free Syrup or Sugar Free Fruit Topping! Just add water, eggs & oil. 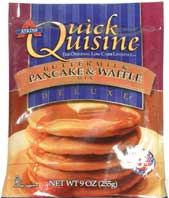 About 10 - 1/4 cup dry mix (4 pancake) servings per bag. Size (inches): 8.66" X 5.91" X 0.79"
Wheat gluten, cornstarch (low glycemic), unbleached wheat flour, corn flour, leavening (baking soda, sodium aluminum phosphate, mono-calcium phosphate, Vanilla (natural and artificial flavor), buttermilk, salt, sucralose (Splenda® brand non-nutritive sweetener).